Food stamps, or Supplemental Nutrition Assistance Program (SNAP) benefits, are offered to Americans who earn a gross income amount that's less than 130 percent of the poverty level. The first food stamp was issued in 1939 and since then has helped millions of American households who otherwise would not have enough to eat. According to the USDA Food and Nutrition Service, about 46.5 million people receive food stamps. According to an article recently published by USA Today, these are the 5 states that have the most people using food stamps. Their ranking is based on the most food stamp recipients per capita. 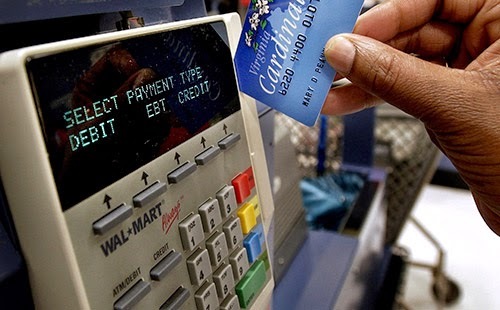 #2 - Mississippi: ranks number 2 with 21.74 percent of its population receiving a total of 650,911 food stamps. #3 - New Mexico: has a total of 448,328 on food stamps, representing 21.5 percent of its population. #4 - West Virginia: 19.96 percent of West Virginia's population receives food stamps, or a total of 369,249. #5 - Oregon: comes in number 5 with 791,222 receiving food stamps, or 19.93 percent of its population. To be eligible for food stamps, a family of four could earn no more than $31,008 per year. Food stamp benefits are about $257 per household. Although some taxpayers object to the cost of food stamps, consider this: with groceries running as high as $1,000 or more per month for some families, the $257 is still a small amount to pay in order for families to put food on their tables.